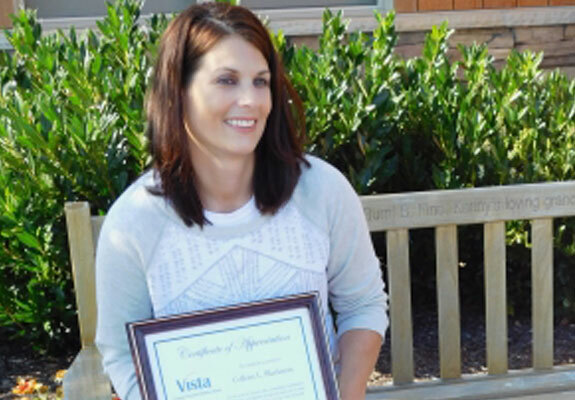 Colleen Blackman, a teacher and 10-year Vista employee in 2016, was honored with a named brick in the patio outside The Vista School main entrance. Please tell us briefly what your current position is and what it involves. I teach 8-11 year olds in the elementary school. My students are mostly non-verbal and are learning to use Alternative/Augmentative communication (AAC). I have an incredible staff who all really care about the students and help to create a fun learning environment for our students every day. What inspired you to work for Vista? I worked part-time in an autistic support classroom before coming to Vista. I was looking for a full-time job, so I applied here. Right away, I knew Vista was the perfect place for me! Sharing in the sense of accomplishment with my students when they learn new skills! What do you wish other people knew about autism? Children with autism sometimes learn differently than other children, but they can still learn! There’s always a different approach or a new strategy to try. You just have to find it and never give up!